No campus security is as effective as Spartan Pepper Spray. Your life is hectic enough without worrying about your personal protection. With Spartan Pepper Spray there is no fear of two legged or four legged dog. Parking lot and parking garage fear is a thing of the past with Spartan Pepper Spray. There are many people that love to exercise, be it running, jogging or walking, but have a fear of being attacked by thugs or bitten by a dog. Prevention of this fear is one of the many reasons that Spartan Pepper Spray is a great device. It is light weight , durable and simply slips over the hand and straps to your wrist. You never have to worry about it falling off your hand, it literally attaches to your body. Stun guns, tasers and other pepper spray devices are either too cumbersome or not easily accessible, SPARTAN PEPPER SPRAY, is protection at your fingertips. 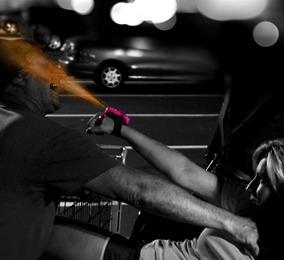 Our state of the art pepper spray device has many unique advantages over other security products on the market therefore enhancing your personal safety. Durable construction resulting in increased longevity of your device. Freedom of movement to use your hands and engage in various activities while still having the capability to protect yourself (i.e., carrying books around campus, unloading groceries or exercising). Securely attaches to hand and wrist assuring a reliable and accurate dispensing mechanism that won’t be displaced during movement or attack. a point of aim to the center of face.